Richard was away in Italy, so the next version of the backscene will have to wait for next month's meeting. The layout has been invited back to the Wilmington Exhibition this October, so there won't be much time for rest and recuperation after Chatham in June. There's also a couple of outings already planned at 2mm Association events in the next two years. Pete T announced that his departure to Wellington (Somerset) is now scheduled for sometime in June. Planning for his "model railway hut" is proceeding apace. The scenery is stored off-site, and not much was brought in for this meeting, so there isn't much scope for interesting pictures this month. The dairy building which Pete T had added last month is worth a closer look. It is designed to fit across the join between the two main trackboards, to help hide the join. It relies on two pegs to position it correctly, but these were a little too tight and were opened up. The break at the end is deliberate (prototypical). 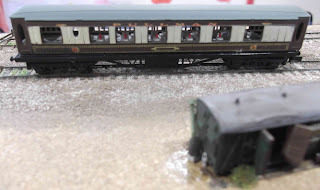 The recent ballasting of that siding had been a little over-enthusiastic, with some encroaching under the building and needing to be removed so it could sit flush on the ground. Also the slightly pink/purple colour of the ballast needs investigation and/or justification. Clearance was checked using a Dapol milk tanker - though overscale in height it crept under the roof without further damage. A boarded crossing was later added at the right end, but probably needs reshaping (and gluing down). This month's implausible visitor is providing overflow dining accommodation for the mess van! In the absence of the lower entrance to the dairy/bottling plant, Pete T's recently-finished milkfloats are positioned here here too. They are heavily hacked versions of standard models from P&D Marsh and Lytchett Manor (ex Gem/Fleetline). I suppose they could be restocking the dining facilities after too many cuppas, but I'm not how to justify the iconic red London bus there (except that there was nowhere better to put it this month). Keith gave the trackwork a thorough testing with his Terrier. It was fitted with skids, giving it improved pickup at the cost of even less weight on the track via the wheels, hence rather limited traction. At this point it wasn't being too heavily taxed. 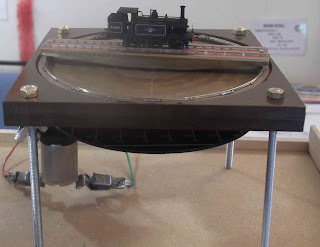 Keith also demonstrated a turntable as a work-in-progress. 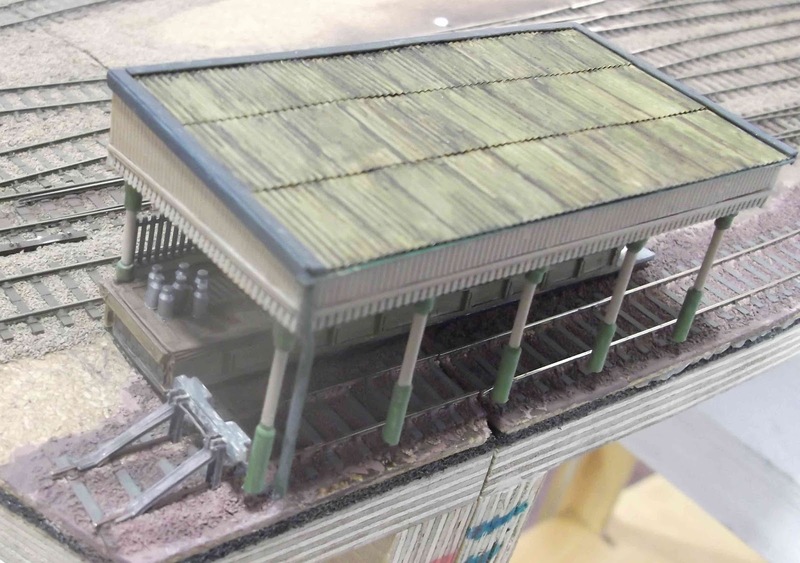 It is likely to finish on his own layout rather than Lighterman's Yard. After a few initial teething problems it powered up and rotated impressively slowly, thanks to its extensive gear train. 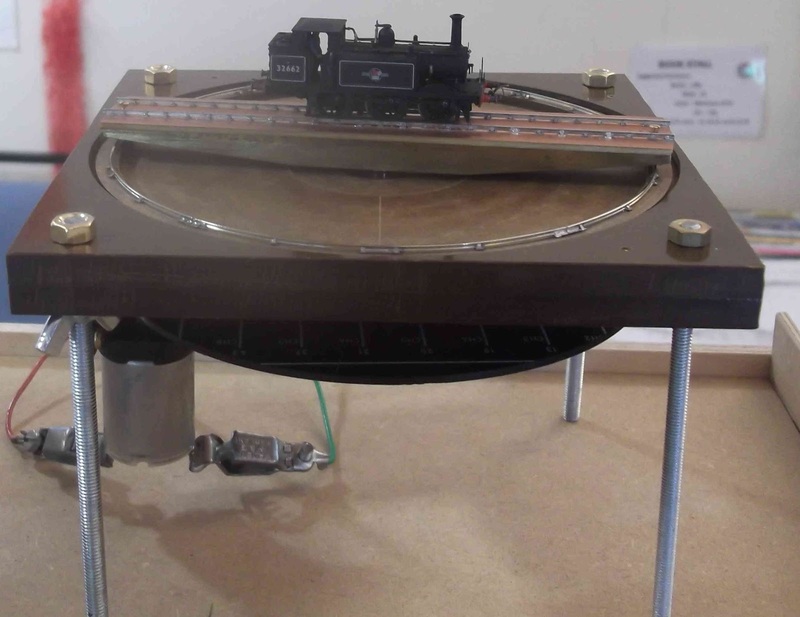 Auto-stopping in alignment with the exit roads is planned, probably based on some form of adjustable stop-switches on the disc below the mechanism.